O.D. Hopkins was already a manufacturer of ski lifts and other related attractions when Paul Roads, owner of Wonderland Park (Amarillo, TX), approached them in 1979. They were looking at installing a new log flume at a reasonable price and Hopkins delivered. The prototype opened in 1980 and it featured a two stop loading/unloading station configuration. The boat was stopped and raised at each spot by two rubber covered bars. This provided a stable step for riders to exit and load. In 1992, in addition to two steel roller coasters, O.D. Hopkins sold “Splashdown” to Castles n Coasters. 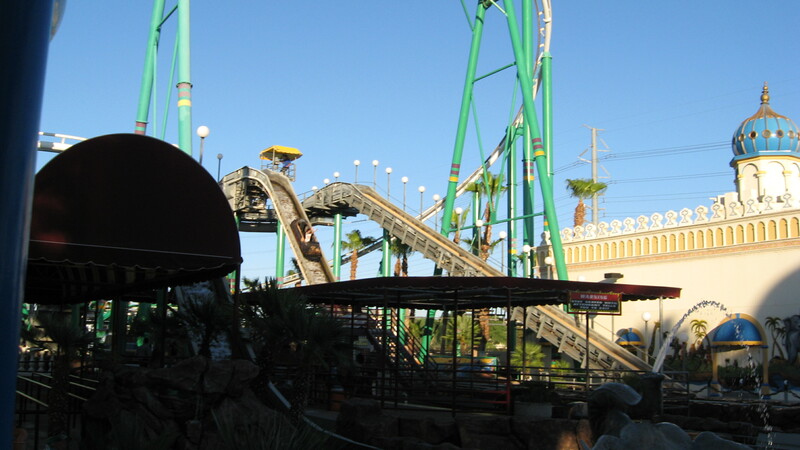 Located in Phoenix, AZ, this park expanded at the time with a new ride section. A major safety feature for Hopkins flumes are the small conveyor belts before each drop. When the drop is not right after a lift, those smaller belts allow proper spacing and can also stop a boat in case the previous boat has not cleared the runout section. This is specially important when the Coaster Drop is used since boats have to go uphill on those. The Policy Pond Log Flume at Canobie Lake Park station conveyor belt was shut down at the time this picture was taken. 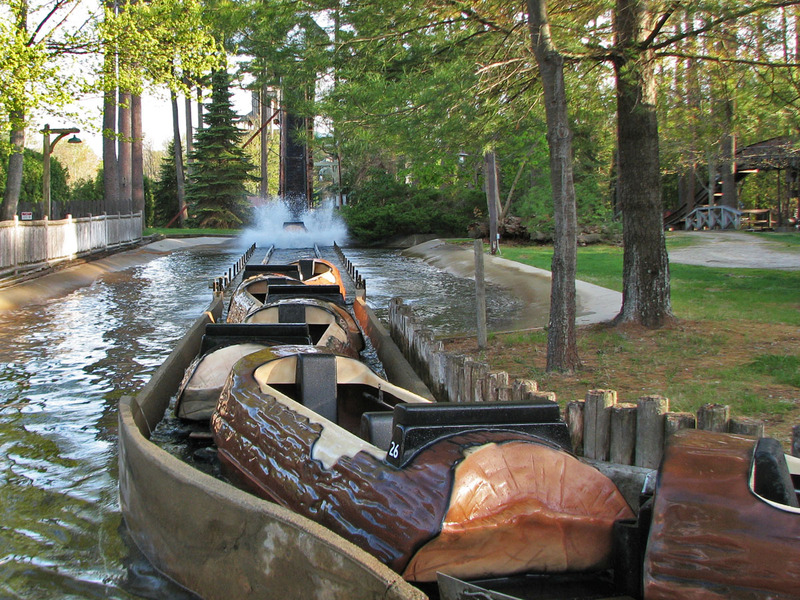 In 1983, Hopkins introduced on the Policy Pond Log Flume at Canobie Lake Park (Salem, NH) a similar loading system to what Mack had been using in Europe. The station was extended and a long rubber conveyor belt installed. It runs continually and boats are slowed to a proper slow pace so that riders can exit and enter safely. It improves capacity immensely and is simpler mechanically than the Arrow turntable. 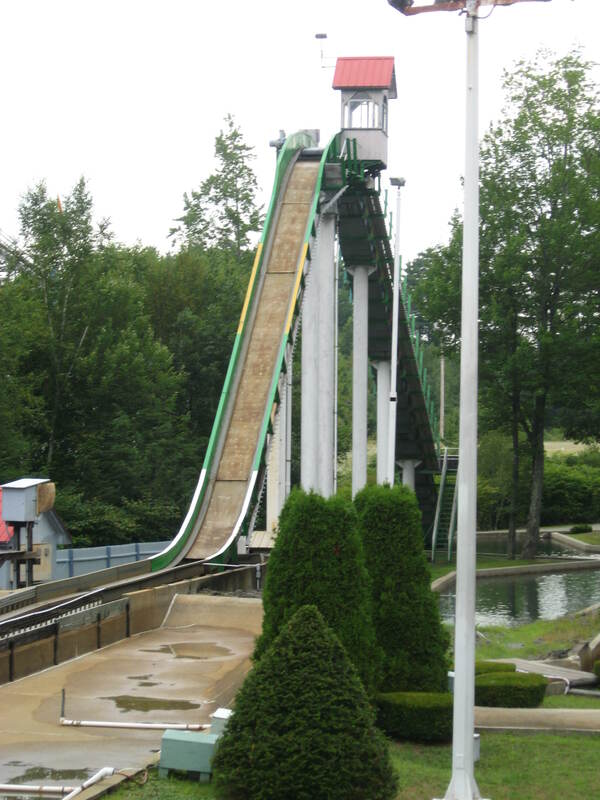 Some earlier Hopkins flumes such as the Yule Flume at Santa’s Village (Jefferson, NH) were modified to get the conveyor belt and that involved extending the loading building. Part of the Menhir Express at Parc Asterix (Plailly, France) drop structure was constructed from trees that were knocked during a storm before construction. You can see the small conveyor belt at the top of the drop. 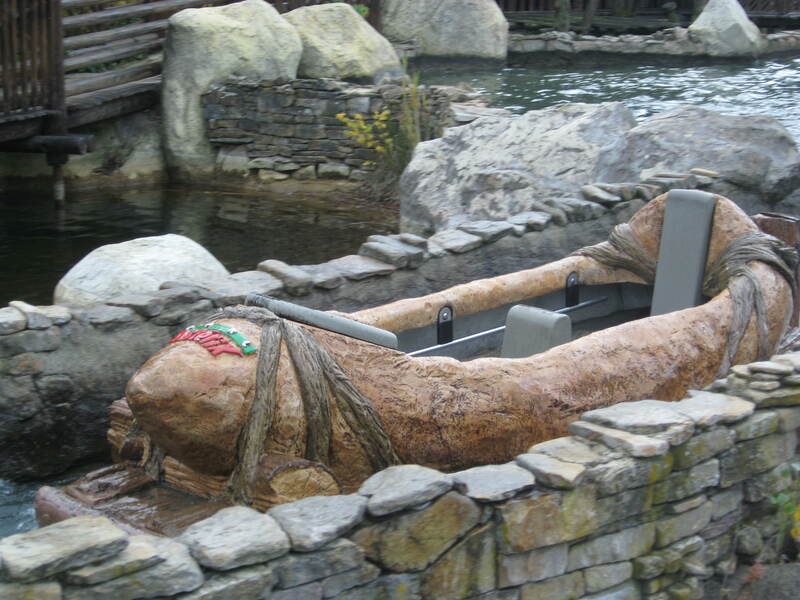 Hopkins designed custom boats themed to floating menhirs (headstones) and each can accomodate 5 riders. The Menhir boats creates a large splash. In 1989, O.D. Hopkins was the partner of Walt Disney Imagineering who installed Splash Mountain at Disneyland (Anaheim, CA). 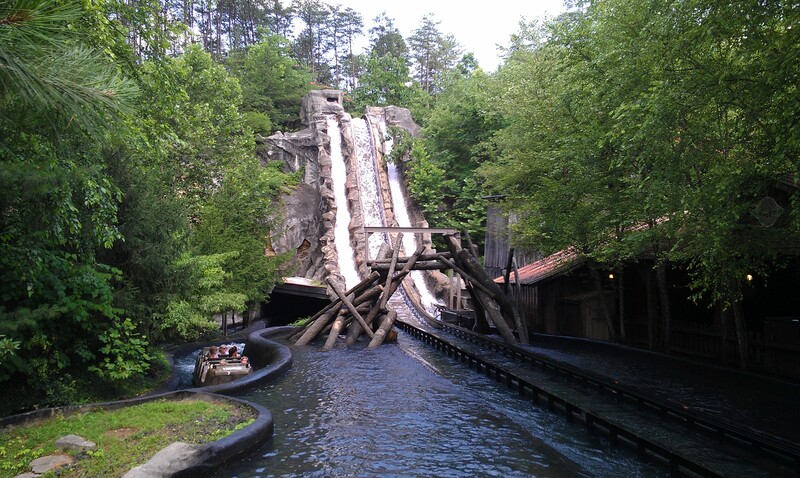 The main innovation for this flume was the “Coaster Drop” present halfway through the ride. 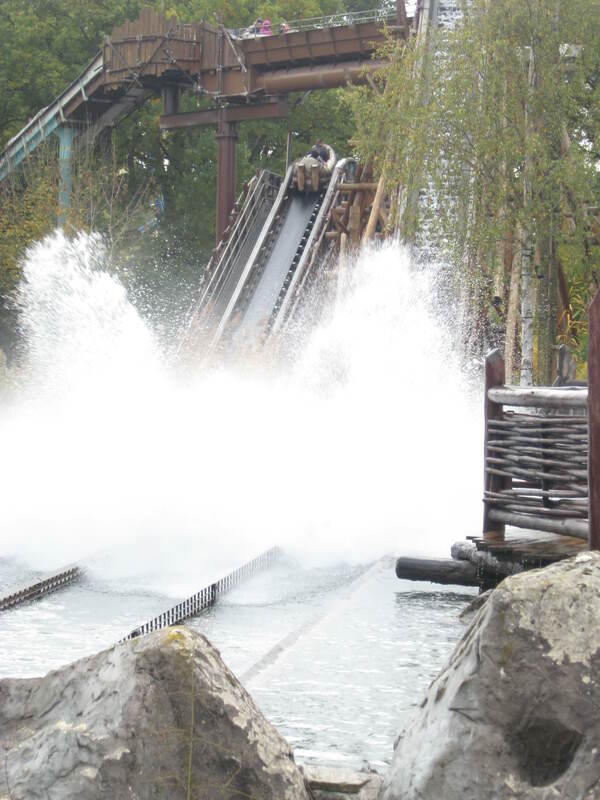 On the Coaster Drop, the boat leaves the trough and rolls down on steel roller coaster track down a dry drop, up a hill and then splash into the water. 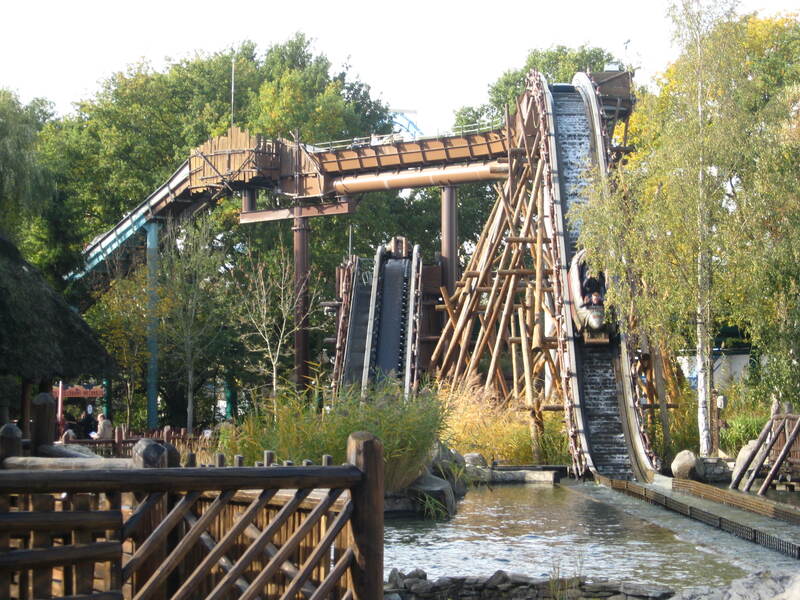 The Coaster Drop was reused by Hopkins for the larger capacity Super Flume, Monkey Falls at Ratanga Junction (Cape Town, South Africa), the Log Flume at Family Kingdom (Myrtle Beach) and the Menhir Express log flume at Parc Asterix (Plailly, France). In 1999, Space World (Fukuoka, Japan) introduced Twin Mercury, a double log flume. In this picture, you can see the calm family log flume, Fantasy Cruise. Adventure Cruise has 3 drops, including this unique spiral drop. The final drop on Adventure Cruise. 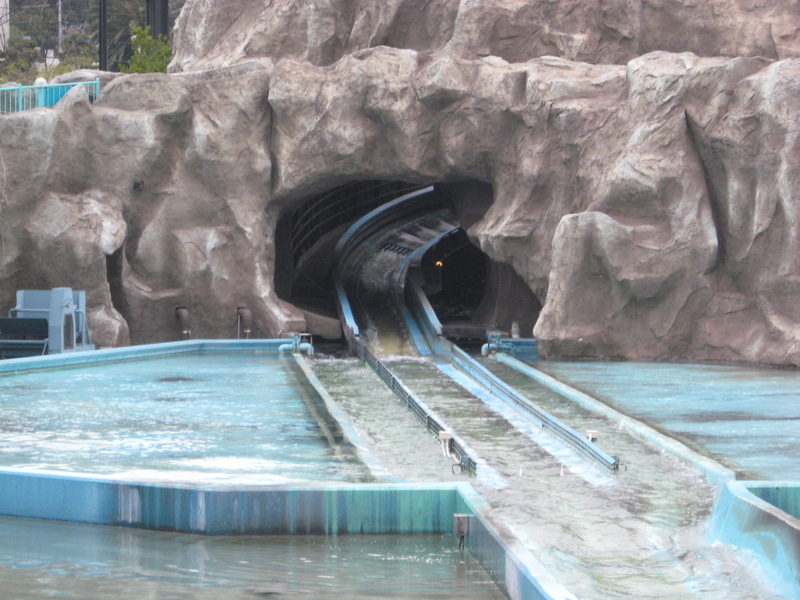 In 1998, Hopkins evolved the log flume to the “Super Flume”. 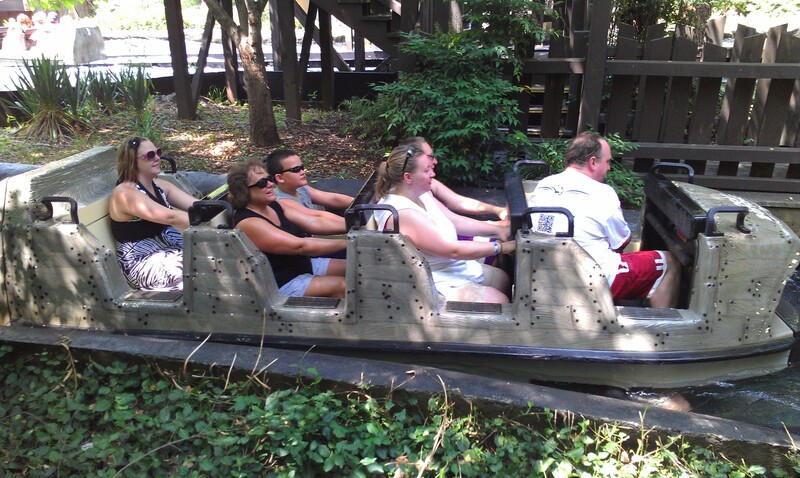 The Super Flume use mechanical chain lift hills to lift large 8 passengers boats up to dizzying heights. Those boats feature 4 rows of two passengers in real seats. In the spring of 1998, Daredevil Dive opened at Dollywood (Pigeon Forge, TN) and is more of a classic flume with no surprise elements. 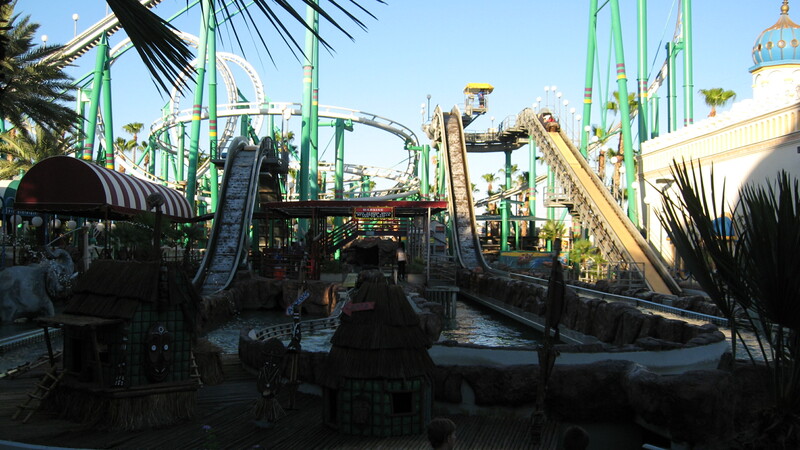 In late 1998, Warner Brothers Movie World Australia (Gold Coast, Australia) opened their installation under the name of Wild Wild West and was later renamed Wild West Falls. That one feature the coaster drop taken after a turntable that spin the boat backward. 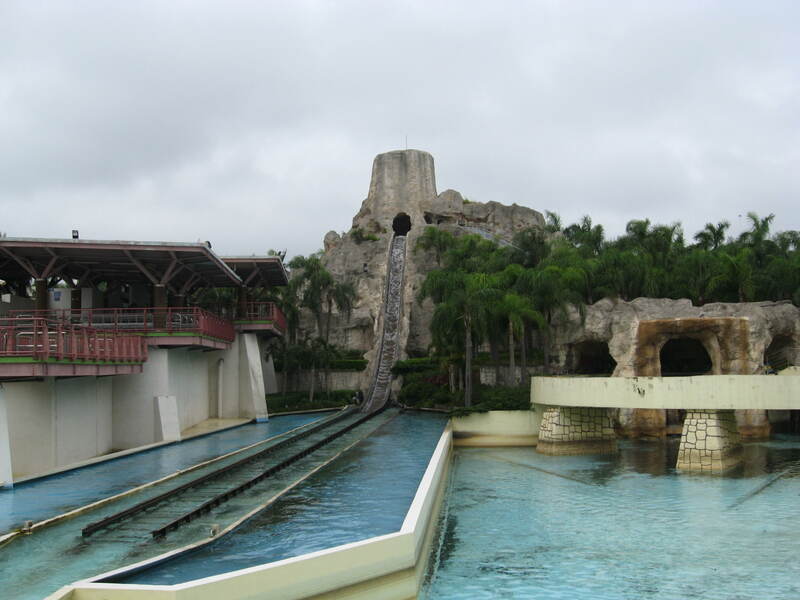 Further SuperFlume opened in 1998 at Hamanako Pal Pal (Hamamatsu, Japan) and at Six Flags Fiesta Texas (San Antonio, TX). 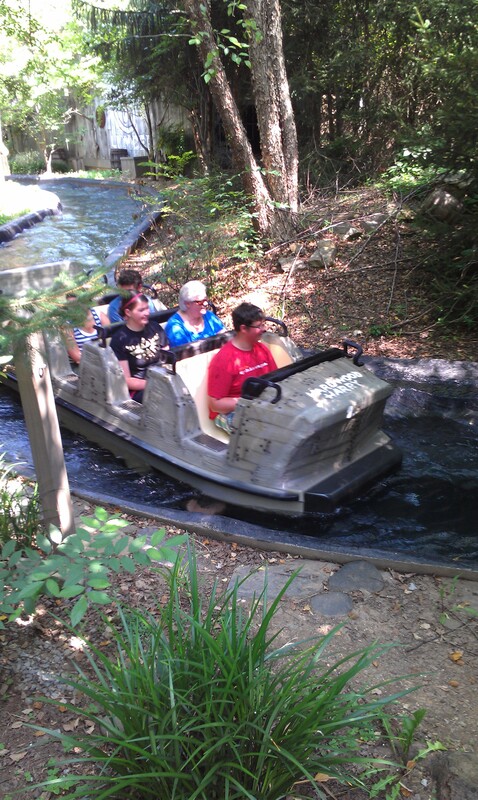 The Superflume boats used on the Daredevil Falls at Dollywood. The drop on Daredevil Falls is themed with two parallel waterfalls. The splash created by the boats. Interestingly, even though the chain cannot be lubrified due to the rubber conveyor belts at the bottom of the lift and in the station, it has a very long service life. Dollywood is getting nearly 10 years of use out of the lift chain on Daredevil Dive. 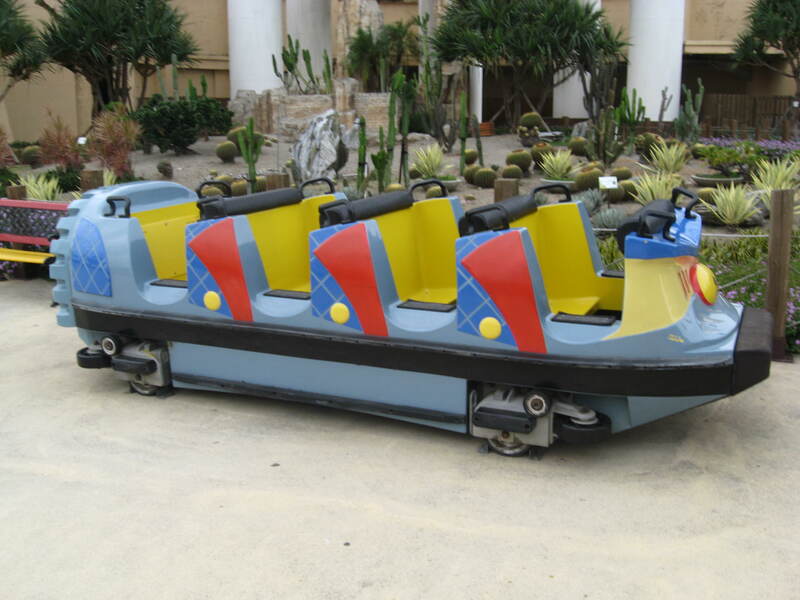 The reason for that is that the load on it is so light compared to a roller coaster train that it does not wear it out. 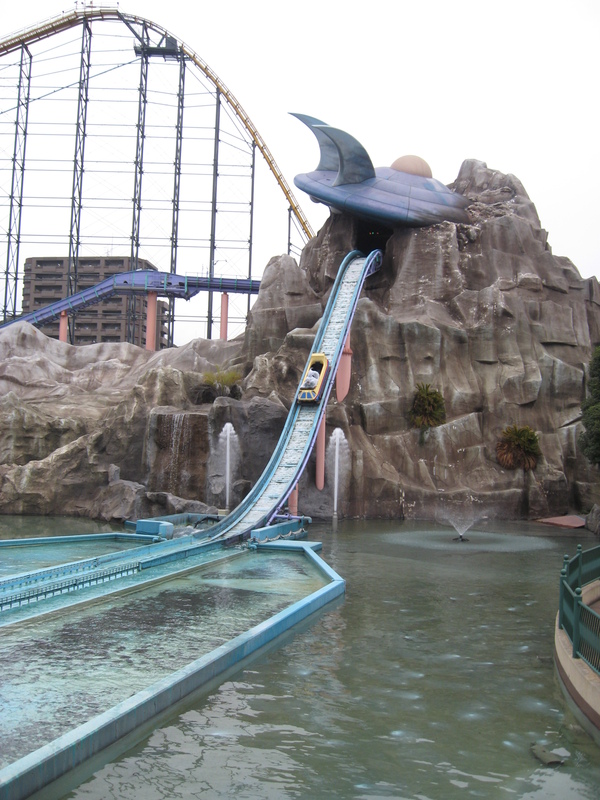 In 1999, Hopkins installed a Super Flume at Discovery World at Lihpao Land (Houli Hsiang, Taiwan). It features the same configuration as Wild Wild West and what is unique about those two is that the boats are taken back to a forward configuration in a simple way. The boat floats backward into a dead end of the channel. A large rubber tire is hung to the wall and cushions the boat when it touches the end. A spinning horizontal tire is mounted between both channels and it pushes the boat to the right, continuing the ride in the other channel. A second turntable is mounted at the top of the main lift hill and serves to orient the boat toward the large ending drop. The unique spacecraft themed boats. This entry was posted in Water Ride and tagged Canobie Lake Park, Dollywood, flume, Funtown, hopkins, log flume, Menhir Express, Parc Asterix, Space World. Bookmark the permalink.